Toothfairy Island ™ lessons are child centered, educational, and culturally sensitive oral health information. Our fun and exciting, bilingual materials create a diversified, pediatric wellness program that begins with oral health as the gateway to the body, and includes nutrition, prevention of germ transmission, safe play to prevent injuries, and true science lessons for even the youngest child. The lessons are layered so that each learning experience builds on and is related to others, creating a solid foundation of health knowledge. Multiple learning modes such as visual, kinesthetic, auditory, musical, etc. are used to reach all types of learners. All lessons meet the AGD Oral Health Literacy Guidelines. 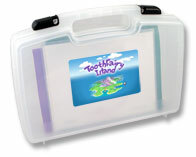 The National Maternal and Child Oral Health Resource Center has reviewed and listed the Toothfairy Island Educational products on their website for all Head Start Programs, hospitals and other pediatric programs. All lessons follow our “Teacher in a Box” format that provides everything needed but water! No in-service training is needed prior to use, and anyone who can read can teach! The TFI Curriculum has been chosen as the main educational provider for the National Children’s Oral Health Foundation. It is currently in over 65 sites nationwide and in Puerto Rico, including seventeen major universities. Current curriculum extends from pre-natal to high school with more innovative programs for all ages under development, including companion pieces for parent education for each age group. This follows Toothfairy Island’s mission of being a global leader in oral health and wellness strategies.